It's a biggie here as Yvonne Jurgens at Nautic Excellences offers a 110m berth for sale at La Marina Aregai near Sanremo, Italy. 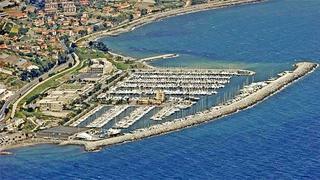 Marina Aregai has become a real reference point for Italian yachting and pleasure boating. Since its opening in 1992, it has offered a wide range of high-quality facilities. The quay is complemented by a rich commercial centre with a wide range of boutiques and food stores and is only 22 miles from Monaco. The purchase price for the 110m berth is €12.7 million for a lease until end-May 2036, through bluewater.